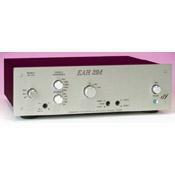 Solid-state phono preamplifier. Moving magnet and moving coil inputs. Selectable loading via transformer for MC. Selectable resistive and capacitive loading for MM. Mono/stereo and polarity switches.